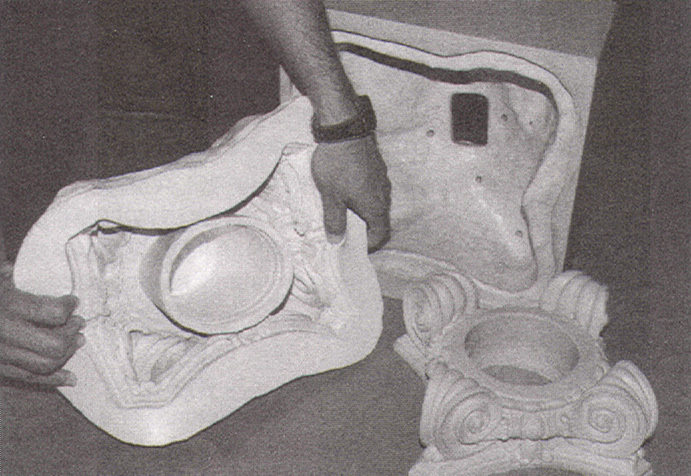 A Poly 15-6 plastic column capital is demolded from a TinSil® 70-10 silicone rubber mold. This rubber is very soft (Shore Al0) and stretchy eliminating the need for seams in the mold to remove cast parts. The shell was made using Poly LiteCast, a very low density, pourable polyurethane plastic to reduce the weight of the shell for easier handling. The column posthole was made by inserting a plastic pipe as a plug in the 70-10 mold prior to casting. TinSil® 70 Series rubbers consist of a liquid Part B base and Part A accelerator, which after mixing at the proper ratio by weight, cure at room temperature to flexible, high tear strength, RTV (room temperature vulcanizing) silicone rubbers. TinSil® 70 Series mold rubbers are tin-catalyzed, condensation-cure systems. They are ideal for molds where easy release or high temperature resistance is needed.They are recommended for polyurethane, polyester, epoxy resins, and wax. TinSil® 70-60 is useful with low melting metals. TinSil® cures thoroughly in twenty-four hours with standard catalyst. TinSil® 70-15 and 70-20 are very soft and good for use with most delicate castings. TinSil® 70-25 is a medium hardness silicone and is slightly tougher and firmer than TinSil®70-15 or TinSil®70-20. TinSil®70-60 is the hardest, heat resistant rubber for casting low melting metals. Silicone rubber is used most often for casting liquid plastic resins, such as polyurethane, epoxy or polyester because the resins or the barrier coats used with them do not require release agent. Thus, plastic parts from silicone molds are usually ready for finishing with no washing of release or surface imperfections due to release agents. Silicone molds also withstand the high temperatures (+ 250°F) of some polyester or acrylic resins or low melting metals better than any other rubber. Thus,silicones' non-stick quality makes short run resin casting easy, but for high production of many parts per mold, release agents are often used to prolong mold life. If this is the case, some polyurethane rubber molds may perform nearly as well at half the price. If your mold costs are high, it may pay for you to review the possibilities of a lower cost rubber with a Bare-Metal Foil Co. representative. Silicone rubber molds are almost never used for cement and plaster casting and are only needed at foundries with the stickiest of foundry waxes. Additives Note: For faster cure use TinSil® FastCat in place of any TinSil® Part A for an accelerated demold. For softer cure add TinSil® Silicone Fluid sparingly to any TinSil® System.